So I found myself thinking a lot about the word “hope” this morning–mostly because I was writing the word “hope” over and over again on little, yellow sticky notes. An organization called Hope House was scheduled to come by sometime today to pick up bags and bags of donated clothes that have been stored down the basement for the past several weeks. 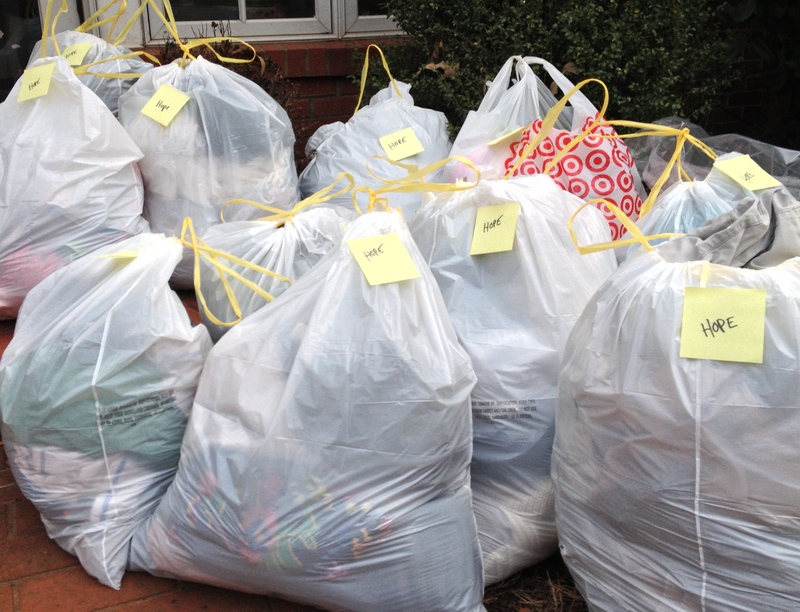 They asked us to label each bag “Hope House,” so I just shortened it to the one word. Writing this word “Hope” over and over again, and thinking about this yearlong experiment in living simply, I started to wonder: can hope be simple, and in the present? Or is hope always something that pulls me away from the present and into some wished-for future? I heard a Friend not too long ago talk about two kinds of hope–a vague sense of wishing (as in “Gee, I hope there’s pie”) and a more focused–and often more active–sense of expectation of a better future. While pie is good, I think the simple hope I’m after will have to be caught up somehow in this more active and focused sense. But how to keep this sense of expectancy without losing myself in the future? Maybe it’s true of all of us, but I know from firsthand experience that I don’t do too well if I project too far into the future. The less I focus on some perceived future outcome–good or bad–typically the better off I am. I don’t think that means I’m not capable of being goal oriented, but I do think as a rule, the more my mind gets fixed on some specific future life destination (again, good or bad), the more I tend to go off the rails. So, how is it possible to hope in that stronger sense–not idle wishing but expectant waiting–and remain mindful and present? Perhaps the key to a simple hope is to keep the expectation but eliminate the focus on the arrival of some future outcome–to nurture a sense of expectation embedded and experienced in the moment itself as it unfolds. What hope do I hold for this very moment? Ugh. Suddenly I feel I’m getting overly philosophical while trying to talk about living simply! I have to say, though, it was somewhat amusing to walk out the front door this morning to see a dozen bags filled with donations, each labelled with the word “hope”–not quite the same as a dozen, elegant peace cranes, but a reminder nonetheless to experience and act upon hope in the living moment. This entry was posted in Uncategorized and tagged attention, heeding, mindfulness, possibility, simple truth. Bookmark the permalink.